You are here: Home / Galaxy Note 4 How-To Guides / How to manage and download Galaxy Note 4 camera effects? When do you need Galaxy Note 4 camera effects (photo effects)? [easyazon_block add_to_cart=”no” align=”left” asin=”0789754509″ cloaking=”default” layout=”top” localization=”yes” locale=”US” nofollow=”default” new_window=”yes” tag=”net7749-20″]When you want to add some special effects to your photos, you may immediately think about Photoshop on your PC or some apps in your phone. Actually, both of the Gallery app and Photos app in Galaxy Note 4 can add many effects on your existing photos. But if you want to apply such photo effects immediately when taking the photo, you then can try Galaxy Note 4 camera effects. The advantage of using Galaxy Note 4 camera effects is the live preview on the screen. In other words, before taking the photo, the preview screen will show the final photo. Once you press the camera button, the photo will be saved with the camera effects applied. This will save you some time to edit the photo in the Gallery app or other apps. You can instantly share the effects-applied photos to your friends. 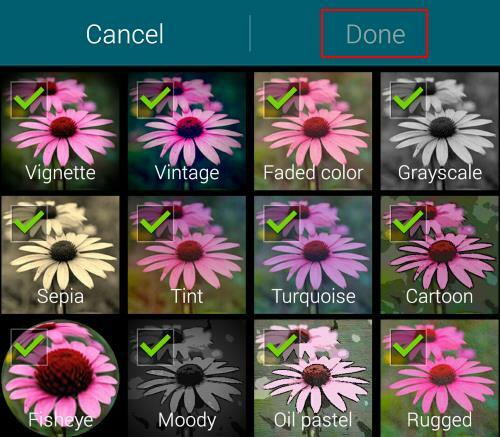 How to manage Galaxy Note 4 camera effects? You can activate and deactivate some camera effects whenever you want. Tap Settings icon (gear) as shown below. Tap Effects icon as shown below. By default, No effects is applied. Tap Manage effects as shown below. Now, you can activate or deactivate some camera effects for Galaxy Note 4. The photo effects checked will be activated and will be available for use. Once finishing the selection, you need tap “Done” to save the changes as shown below. How to download and install Galaxy Note 4 camera effects? 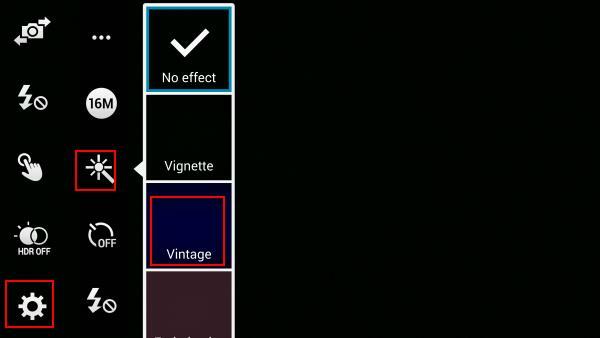 In addition to the 12 pre-installed camera effects, you can also download and install more effects from Galaxy Apps. Some of these camera effects are free. Some are not. Scroll down. Tap Download as shown below. After tapping Download, you will be directed to a hidden page in Galaxy Apps as shown below. 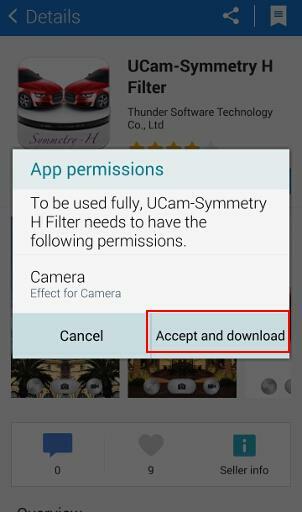 This hidden Camera page in Galaxy Apps can only be accessed from Galaxy Note 4 camera app. There is no way to access it directly. In this page, all camera effects that can be used in Galaxy Note 4 (i.e., compatible with Galaxy Note 4 camera app) are listed. As mentioned above, some of these effects are free. Others have a price tag. For example, you want to use the horizontal symmetry filter (which mirrors your photo and combines with your original photo). 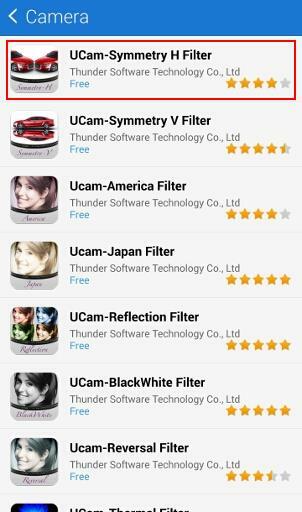 Tap UCam-Symmetry H Filter as show below. Tap Free in the details page. Like installing other normal Android apps, you will be prompted with app permissions window. 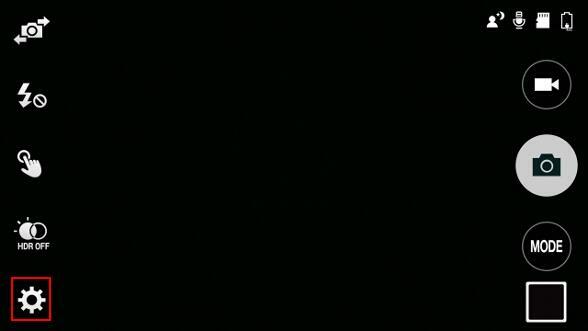 You need authorize the camera access for this app (camera effect). Tap Accept and download to start the installation. 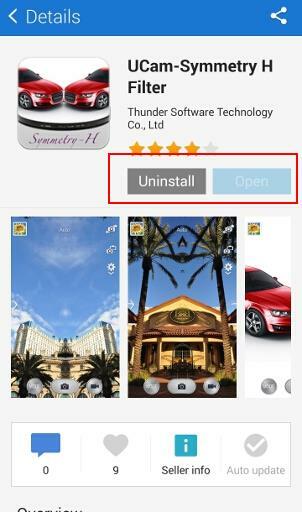 Once the camera effect is installed, you will notice the Free button is replaced with Uninstall in the details page. Although this is installed as an app, it is not a standalone app. So, you cannot find it in the app drawer. Of course, you cannot launch it as a standalone app. But it will be available in Galaxy Note 4 camera app as a new camera effect. Now, this symmetry filter is available in the list of effects and you can use it immediately. If you tap the Manage effects button now, you can also disable/enable it as shown below. How to use Galaxy Note 4 camera effects? By default, there is no effect applied to the Galaxy Note 4 camera. 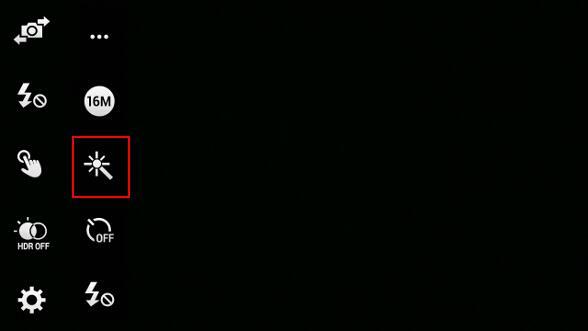 To use Galaxy Note 4 camera effects, you need tap Settings icon–Effects icon. 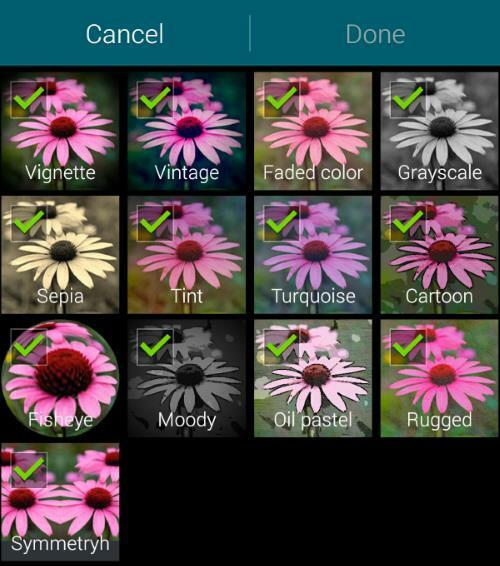 Then you can choose one of the available Galaxy Note 4 camera effects as shown below. Please note, settings for Galaxy Note 4 camera effects are only valid for current session. When you start the Camera app again after closing it, the default No effect will be used. So, you may have to set the Galaxy Note 4 camera effects again. Why I cannot use effects? The icon is grayed out! When HDR is on, you cannot use any camera effects on Galaxy Note 4. Can you manage and use Galaxy Note 4 camera effects on your phone now? If you have any problems or questions to manage or download Galaxy Note 4 camera effects, or have problems to use Galaxy Note 4 camera effects, please post them in the comment box below. I deleted my flourecent filter from my camera on my note 4 and cannot get it back or one like it. Its not an option in downloads. I loved it. So unique and I delete it like a moron! Is there anyway to get another? I can’t find one anywhere. Tried all of playstore. Can’t find it in my files or anywhere. Some filters (effects) were removed in the update. You cannot get them back. But there are many photo editing apps which can give similar options. I just got my new Note 4. I had a Note 3 before. I used those filters a lot, but now I miss my favourite filter “Gouache”. You can’t download it any more. So I saved this filter as a apk file in note 3 and loaded and installed it in my Note 4, but this seems not to work, it doesn’t show in the filter gallery. Where is the Gouache filter? Or is there a way to bring it from my Note 3 to my Note 4? Not sure about that filter. But you cannot use the old apk files for the new camera. You may try other photo editing apps. Did you check whether it is available in manage effects? I’ll try that but it doesn’t show download button, it shows installed, but the open button next to it is lighter colored, and doesn’t let you open it from there. That’s is normal. Camera effects are not standalone apps. You cannot open then as standalone app. You need access them as plugins from camera app. no error. i get the arrow on the top showing its downloading. and it will show up as downloaded and you cant press the open button. It seems they are not installed properly. If installed, it should not show you the download icon. You can try to reset camera app in settings – applications – all – camera. Tap clear cache, then tap clear data (this will NOT delete any photos). Now try to download the effects again. And of coarse I don’t see any setting for camera. I’ll look around tonight and try and find it. Then, you need try to download again. When you install them, did you get any error messages? Are these effects are listed as installed if you tap download again? I cant find the new filters effects i just downloaded. Only the ones that were already on there. if you tap manage effects, can you find them? Recently, when choosing any of the filters that I downloaded I get the message “Warning. Server error. Restart camera.” Anyone else getting this? All the filters that were in the camera from the beginning works fine. Did you try to re-download? Yes, I have uninstalled and re-downloaded the filters, cleared the cache and data for the camera, but still the error message. Dear sir , there is many effects in note 2 camera that does not exist in note 4 , like filtering colors to keep only one or two colors in photo while you shot. (ex. Gray scale including green color only). How to got these effects ? Most of these effects can be found in photo editing apps, not camera apps. The builtin editor in gallery app have many filters already. You can also try the photos app. 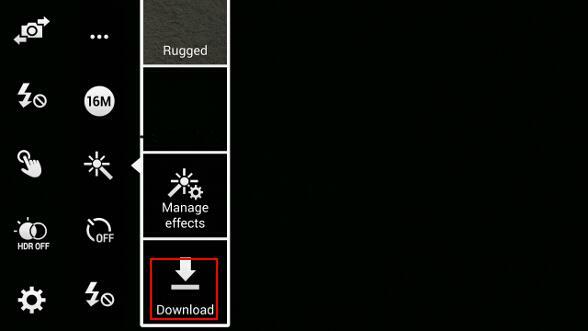 When I try to download new camera effects and tap on download button nothing happens. The hidden page won’t open. Please help. 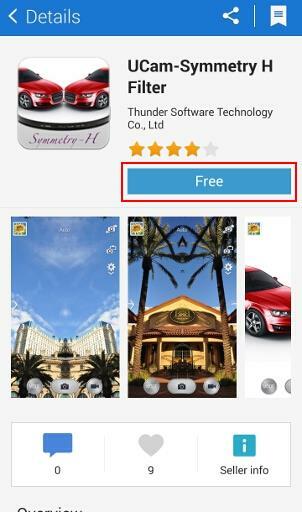 Can you use Galaxy Apps app normally on the phone? Hi I have Samsung note 4. Everything works fine except on the selfie picture it seems cloudy. I tried to compared my note 4 at the Verizon wireless outlet. And there note 4 selfie picture is very clear..Is there away I can make it clearer?.i tried the setting and the mode but nothing change. Dirty front camera? You may try to use lens cleaner to clean it. I’m begging for help wherever I can. I do not show the gear/settings icon on my Note 4 screen. Also, for Effects, I only have Auto, Panorama and Beauty. This just happened. any help surely appreciated. Are you on easy mode? If yes, you need change to standard mode at settings – easy mode. You may try to clear cache and clear data for the camera app in Settings – application manager – all – camera. Then try again. I just happened to come across a camera filter that does a much better job at the ‘b&w sketch’ look than the gallery version. True, though, that you lose the flexibility of having the original photo when using the camera filters directly. Is there a way to use the downloaded camera effects in the gallery editor afterwards? The set of effects available doesn’t seem to be the same. Probably not. The camera effects for camera app are different from those in Gallery app. If you are comfortable with editing photos in gallery app, you should not apply camera affects when taking photos. Hope Samsung can unify these features in future devices. Are you in easy mode? Check settings – easy mode and make sure you are in standard mode. Thank you Simon! I spent hours on the phone with tech support and visited two “Sprint” stores to try and fix the camera settings button. All reps told me my phone was defective and I needed to replace it under warranty. Changing the mode to standard was the answer. Samsung needs to update manuals, tutorials, and other material to highllight this fix. Glad to know it works for you now. Some settings are not available when in easy mode. This also affects some Samsung apps. We will try to highlight this in future guides and try to test them in easy mode. Is there any way to get note 2 filters in note4 camera? No, you can only use camera effects for Note 4. After Marshmallow update, Samsung tries to unify camera app and you can get additional camera effects from Galaxy apps. But some effects for Note 2 were not migrated to Note 4.